The X-Men have a long history of tampering with the past to create a better future. It’s an apt metaphor for what director Bryan Singer’s sets out to do in X-Men: Days of Future Past. However, as the merry band of mutants has often learned, results may vary. X-Men 2 (2003) was a bit clunkier, despite its strong source material (Chris Claremont and Brent Anderson’s classic 1982 “God Loves, Man Kills graphic novel.) Still, the themes of tolerance and acceptance in the face of fear and fanaticism — the bedrock of the X-Men’s struggle — came through and made for a solid sequel. Then, things took a turn for the worse. Singer’s departure opened the door for Brett Ratner and his nihilistic X-Men 3: The Last Stand, a film so bad that much of it has already been retconned off screen without even bothering to offer explanations. (Professor Xavier is alive now? OK. Just, please, let us never speak of it again.) If you’ve ever wondered why so many people consider Ratner the Nickleback of film directors, watch X-Men 3 and try not to punch the screen. Singer returns to the franchise to clean up Ratner’s mess while also merging the continuity of the first three films with Matthew Vaughn’s much more successful X-Men: First Class from 2011, as well as the two forgettable Wolverine films. Considering all the heavy lifting being done here, DoFP is surprisingly not terrible. The film is an adaptation of 1981’s classic storyline of the same name by legendary creative X-team Chris Claremont and John Byrne. In it, readers are shown a dystopian future where mutants and, eventually humans, are hunted practically to extinction by Sentinel robots. This reality is the result of decades of anti-mutant hysteria set off back in 1973 when X-Men foe Mystique assassinates a public figure. 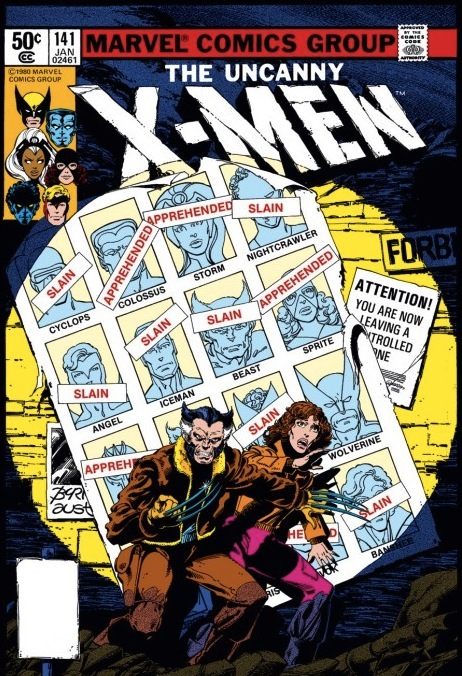 What remains of the X-Men (most are dead) are on the run and dwindling fast. A plan is devised to project X-Man Shadowcat’s consciousness into her younger self in the past to stop Mystique and alter the timeline. You get all that? If not, then you’ve got some homework to do, because DoFP spends zero time bringing viewers up to speed. It’s hard to tell if this is aggressive fan service or just a frantic sprint from the franchise’s sullied past. For those steeped in mutant mythology, it’s pretty easy to keep up. For newbies, good luck. Knowledge of the past films, characters relationships and personalities are all assumed. As a longtime X-fan, I didn’t mind, but I can see how a casual viewer might feel alienated. The film does take some liberties with the original story. Since this franchise has always been the Wolverine (and Hugh Jackman) Show, it’s he who is sent into the past. Mystique’s shapeshifting biology also becomes a key component in making the future sentinels even more deadly, further elevating her role. Neither change is particularly egregious, though it is disappointing that fan-favorite Shadowcat — played here by a once again underused Ellen Page — is not given more to do than sit around in the future, which is kind of a bummer. In comics, DoFP was a gamechanger. While the “save the future” trope might seem tired these days — Terminator, Back to the Future, Lost, Fringe, Community and many more have done it — Claremont was a trailblazer in using this story device. After DoFP, Time travel and alternate realities became an integral part of X-Men storytelling moving forward. Given the announcement that the next film’s protagonist will be the immortal, time-spanning mutant Apocalypse, it looks as like the movies will follow suit. So does it work? Kind of. If the goal of the film was the clean up the franchise, mission accomplished. As a standalone X-film, however, it’s less successful. Again, this is a movie for fans that is actively trying to undo much of what came before it. The entire film is a giant retcon. As an exercise in and of itself, my inner geek thinks that’s pretty cool. Retcons are fairly common in comics, and seeing it deployed in a film is fun to watch, if only to see how Singer planned to pull it off. But aside from a handful of cool moments, DoFP not that much fun. Like Amazing Spider-Man 2, the film is too busy getting to the next installment to tell strong standalone stories. Both Fox and Sony are clearly chasing Marvel in trying to replicate the Avengers’s, but neither has been able to find that sweet spot between franchise building and storytelling that way Marvel has. By comparison the Spider-Man and X-Men films feel like a kid dumping his action figures onto the floor and creating the BIGGEST BATTLE EVER only to come back tomorrow and do it again. It’s fun, but shallow — and not particularly satisfying. The performances, however, are, for the most part, strong enough to keep viewers engaged. Patrick Stewart and Ian McKellen are once again great as the present/future Professor X and Magneto, mutantkind’s Felix and Oscar. In the past, James McAvoy and Michael Fassbender pick up 10 years after the events of First Class. Fassbender brings just the right amount of darkness and revolutionary zeal to the Master of Magnetism. McAvoy, meanwhile, gets to play a maudlin Charles Xavier, without his telepathy and still reeling from the fallout of the previous film. It’s all too convenient and entirely out of character, but it presents a series of narrative obstacles for the film so there you go. Jennifer Lawrence is the clear standout though. Mystique is a calculating, cold-hearted assassin, who, despite her outwardly selfish motivations, has sees herself as protector of mutantkind. 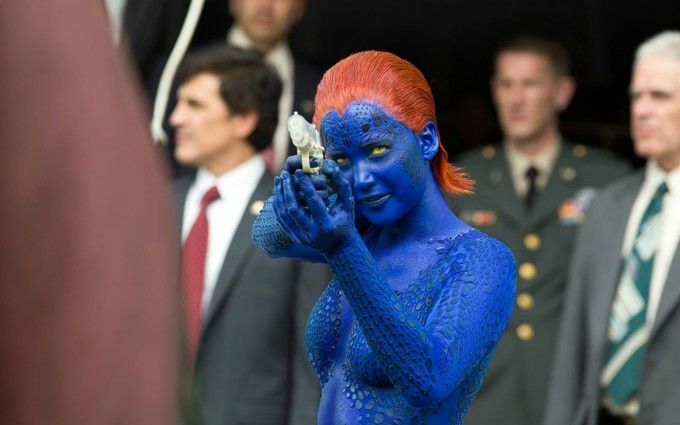 Lawrence demonstrates Mystique’s powerful agency and her wounded soul. It goes much deeper than the femme fatale, second banana portrayal Rebecca Romijn brought to the role in the first three films, managing to reveal fragility and warmth beneath that cold blue skin. As Bolivar Trask, Peter Dinklage is the film’s main protagonist as creator of the Sentinel program. In the comics, Trask is your standard mutant-fearing bigot. Here, however, his motivations are let vague. Dinklage does great work, but the casting is a bit of a head-scratcher. Given the hardships little people have faced over time, one might think that a person with dwarfism would be more sympathetic toward the plight of mutants. It’s something that is never mentioned, and while I can appreciate casting Dinklage for his top-rate acting chops without considering his physicality, in this role it proved to be a distraction. 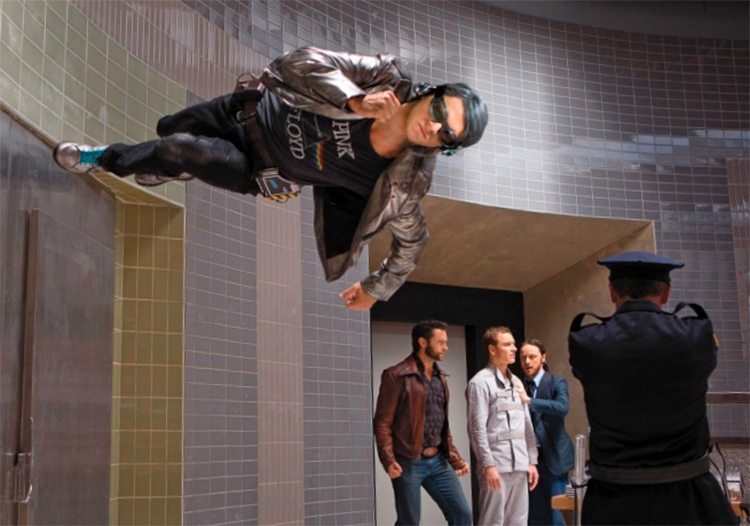 Two visual standouts are Quicksilver (Evan Peters) and Blink (Bingbing Fan). Peters is a lot of fun in his too-brief appearance as the fast-talking speedster, but his abilities are use to great visual (and humorous) effect. Blink, a teleporter, is also responsible for some of the film’s more dynamic and vertigo-inducing scenes, where punches are thrown from across the room and characters drop through the floor only to appear from the ceiling. 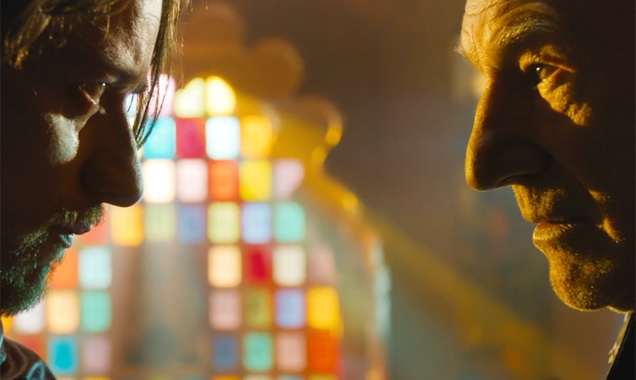 To be sure, when it comes to spectacle, DoFP does not disappoint. When you have so many characters with so many awesome (emphasis on the awe) powers, keeping it all from turning into a jumbled mess is a challenge. Singer manages it well. Several fight scenes in which fellow X-Men use their powers in tandem are pretty damn cool. So where does this leave us? On a scale from Amazing Spider-Man 2 to Captain America: The Winter Soldier, X-Men: Days of Future Past lands somewhere in the middle. While it’s not the craven, chaotic commercial vehicle Spidey was, it falls short of the smooth, smart thriller Cap gave us. Nonetheless, the X-franchise seems to be learning from its past mistakes, which gives us all hope for the future.